The Visconti Rembrandt has become a staple of the Italian pen maker’s line. It is priced well, attractive and handles beautifully. The body and cap are constructed of a variegated resin, which gives it a look reminiscent of chiaroscuro (hence the Rembrandt moniker). This pattern of light and dark varies between each pen, meaning that any single piece will differ from the rest with its own unique look. Visconti has taken a different approach to the Rembrandt line by utilizing a magnet inside of the cap to keep a secure hold onto the body of the pen while not in use. This alleviates any chance of damage to the pen through cross-threading. The cap posts onto the back of the body via friction. The stainless steel nib resides within a metal front section which provides a nice color contrast as well as some weight to the body of the pen. 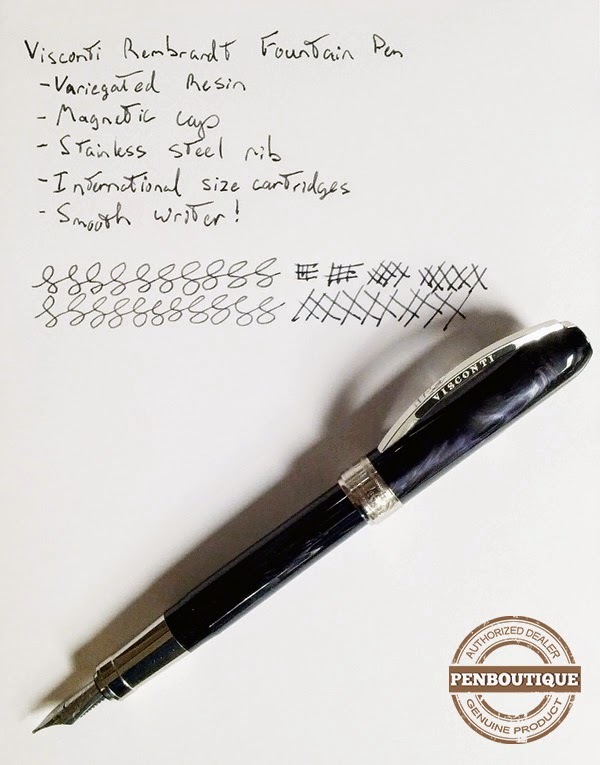 There is not a dramatic step-down in size between the body of the pen and the front section, which along with the lack of threads provides for a very comfortable experience while writing. International size cartridges are used and a converter is included. The Rembrandt is without a doubt a smooth writer. I do find that it balances better when the cap is posted, as the magnet in the cap adds weight to the rear. The use of international size cartridges is a huge plus as it opens your ink selection to a wide variety of brands and colors and especially if you do not want to use the converter for any reason (travel, etc.). The fact that the nib can be easily removed from the front section is a boon to a thorough cleaning and something which I have come to appreciate when cleaning pieces we have demoed for customers. The size of the Rembrandt is just right – not so large as to be an encumbrance, but not so small as to lead to cramps while writing for long periods. This is obviously a personal preference, but I have found this series to be a good fit for most. If you’re looking for a quality piece that doesn't break the bank and yields a great writing experience, give the Visconti Rembrandt a hard look. I think you’ll be happy with the results! How can the nib be removed from the section, as you say? ?